If you’ve been playing at cryptocurrency casinos online for a while now, you’ve probably seen all kinds of websites, from amazing ones to others that you might want to avoid at all costs. But rarely have there been any crypto gambling platforms that put so much control into the hands of their players as the one and only Fortune Jack Casino. Continuing the trend of working closely with its player community, the casino will be giving all of its members the power to decide which cryptocurrency to add to the website next in a new groundbreaking campaign for the industry. Need More Coins? Just Say So! For some time now, Fortune Jack has been in the spotlight of the cryptocurrency gambling sector as a casino that continuously works on growing and improving its offer. From adding tons of new slot machines and unique provably fair games to creating regular tournaments and giving away Bitcoin for notable cryptocurrency contributors, Fortune Jack is a brand that’s not like any other. A few days ago, the team behind Fortune Jack announced that they are taking things to the next level with a new campaign that will periodically add more new coins to the casino. The campaign is officially labeled as Coin Primaries and it is set to launch within a month. The idea is to involve the spokespeople and communities of up-and-coming coins Fortune Jack plans to add so that players can best decide which token they want to use in the future. At present, the casino revealed that it has four new coins in mind: Tron (TRX), Ethereum Classic (ETC), EOS, and Verge (XVG). Tron has been especially popular during the past month and it was even featured on Hacked magazine’s latest 5 Altcoins to Watch This Week segment, so it might be one of the top favorites along with ETC. Once the campaign starts, members of the casino will be able to vote on their preferred cryptocurrency on individual landing pages and the coin that will get the most votes will be added to the platform. 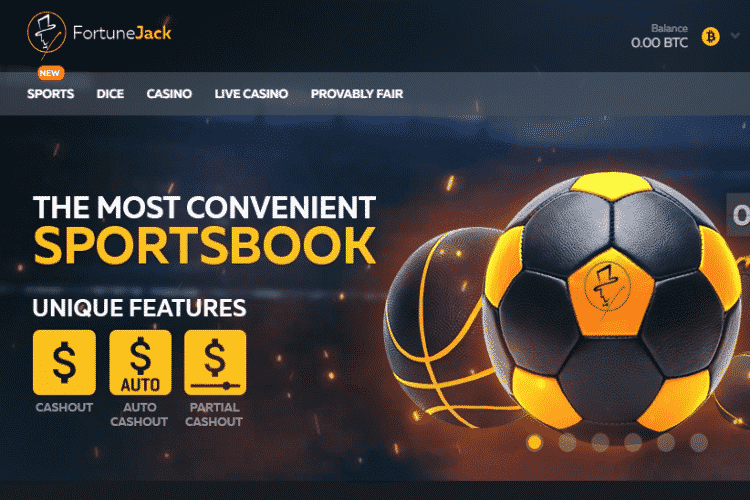 While the new altcoins may take a while to arrive, what’s already live at Fortune Jack is the casino’s brand new sportsbook. Announced on January 15th, Fortune Jack’s sportsbetting segment is a strong addition to the website that aims to make the casino more diverse than ever before. If you’re a member, you can already enjoy the first version of the sportsbook which allows you to bet in any currency but receive payouts in Bitcoins only. From the looks of it, interested bettors will be able to enjoy hundreds of betting markets from a variety of popular sports events, including the NBA, NHL, UEFA League, and many more. The sportsbook also offers a new unique cashout tool that allows for automated or partial cashouts. If you’re interested in checking out the available sportsbetting markets and events, just use this link to visit Fortune Jack Casino!